Switzerland's top ETA, Tommy King, performing 70s Elvis. Photo provided by Tommy Meyenberg. It is such a pleasure to introduce Switzerland’s ETA Tommy King, aka Thomas Meyenberg, to SIDEBURNS Magazine followers. I wish to thank Tommy for sending along his bio and photos to post. In addition to two articles, one about a song competition Tommy entered, and the other, a promotional article from a booking agency that extols the many talents of ETA Tommy King, I have included three videos. I have watched and enjoyed Tommy’s live podcasts from his car, where he comfortably responds to comments from his many fans in German, Italian, and English. As well as being a professional Elvis tribute artist, Tommy is a magician and an entrepreneur. ETA Tommy King is, indeed, a multi-talented individual. I was born in Switzerland very close to Zürich. I have a sister and a brother, and neither is musically talented; but my brother, Andy Meyenberg, has been world champion in wakeboarding several times. A young Tommy Meyenberg performing as Elvis. Photo provided by T. Meyenberg. The first Elvis Song that I sang at school in 1976, when I was 6 years old, was “I Got Lucky”, and since then, I am a huge fan of Elvis and his music. As a singer and performer, I try to be myself, since impersonating Elvis, in my humble opinion, is impossible because there was and is only one King - Elvis Presley! Besides my jobs as an Elvis singer and tribute artist, and magician (www.zauberer-rasmus.ch), I’m an inventor of magic and sell my tricks all over the world. Magic is my second passion and love. I also produce a product to make huge soap bubbles (www.riesenseifenblasen.ch) which are 100'% made in Switzerland. EUROVISION: As a musician who sings at many weddings, Tommy King wants to represent Switzerland in a song contest. He is a passionate singer; but not only that, Thomas Meyenberg, aka Tommy King, greets us full of showmanship. "I am the singer of this song, but the participation was not my idea." A producer who was looking for a voice that sounds like Elvis had approached him. At the end of September, they met for the first time, and now the rock'n'roll number, "Daddy's Sugar Girl", has been recorded professionally with the accompaniment of backup singers. "I really like the song," says Meyenberg. Hopefully others will also like the song as well, because the team behind the recording has been promoting it for Swiss representation at the Eurovision Song Contest (ESC) in Sweden, which will take place in May. Tommy already knows exactly what his appearance in Stockholm should look like: "Of course I will wear some glitter, and the backup singers will not be dressed too conservatively." He can imagine that there will be two or more dancers - if his dream comes to fruition. Tommy King has to compete against 175 competitors for just one place in Stockholm. Everything started in Unterägeri; however, the singer can draw on a wealth of experience which he always shares on stage, he says. Already as a seven-year-old, Tommy had appearances where he sang songs by Elvis. At age eleven, he appeared in front of 1,200 spectators in the tennis centre in Unterägeri. Ten years later, he participated in the first Swiss championship in karaoke singing. “In a competition of more than 600 participants, I was among the last 19. I'm still proud of that today.” Elvis Presley has always accompanied him. Meyenberg has neither thought nor believed that he could make singing a profession. It is probably due to his modesty that he is Switzerland's most famous Elvis impersonator today. He does not, however, like to be called an “impersonator”. "I see myself as an Elvis tribute artist and not as a copy." In addition to his Elvis shows, Thomas Meyenberg is also in demand as a magician. In this industry he is on the road as Rasmus. "For a long time I was on the go as an artist," he says. In 2010, he finally decided to put everything on one card: "He who does not dare, does not win." When it comes to work, Meyenberg is a perfectionist through and through. For example, he did the fine tuning for the video for his ESC contribution. "I was not satisfied with the first version, so I took care of it myself." He still was not 100 percent convinced by the video. The number of competitors in the song contest will be determined by the number of submissions. The ten best interpreters of the Internet platform, as well as six Wels and three Ticino candidates, will present their song to a panel of experts. In the live competition vocal quality, as well as stage presence, are evaluated. Six songs will be screened on February 13 in a live show on Swiss television after this round. The TV audience and a jury of experts each determine 50% of who should represent Switzerland at the ESC in Stockholm. Getting into this live show is the real main goal. "That would be really awesome," says Meyenberg. The competition is very strong - and even comes with its own canton, for in addition to Meyenberg, former winner Marcellina will sing "Perfume of Love". Tommy King has no illusions: "At 45, I am no longer such a dreamer, but rather a realist." ETA Tommy King looking great in his '68 Comeback leather outfit. Photo provided by Tommy Meyenberg. Tommy King: The Real Elvis Presley Feeling If you want the real Elvis Presley feeling, then this is the place for you. Like no other, Tommy King knows how to sing the songs of Elvis Presley authentically and true to the original LIVE. His velvety soft voice, his movements and poses guarantee you the real Elvis feeling. Tommy’s atmospheric and likeable performance makes every event an unforgettable experience. The unparalleled way Tommy King entertains audiences with his authentic Elvis voice, styling, moves and gestures of Elvis that are perfectly imitated. Tommy King understands like no other, the audience from Anfang that was under his spell. Tommy King's 30- to 90-minute Elvis shows make every event an unforgettable experience. His repertoire includes more than 140 Elvis songs that he sings for his audience in "Tommy King LIVE". The spectators are sympathetically and professionally involved in the Elvis show. Since his earliest childhood, Tommy King has been passionate about the music of Elvis Presley. As a 6-year-old boy, he sang his first Elvis songs. At the age of 11, he was on stage for the first time. The incomparable voice, the unforgettable songs, as well as the charisma and sympathy of Elvis, have influenced him since his earliest childhood. Tommy King became the Swiss champion of Elvis tribute artists in 1997. He is the only Swiss ETA to interpret the 50's, 60's and 70's Elvis. Song requests are very often fulfilled spontaneously. 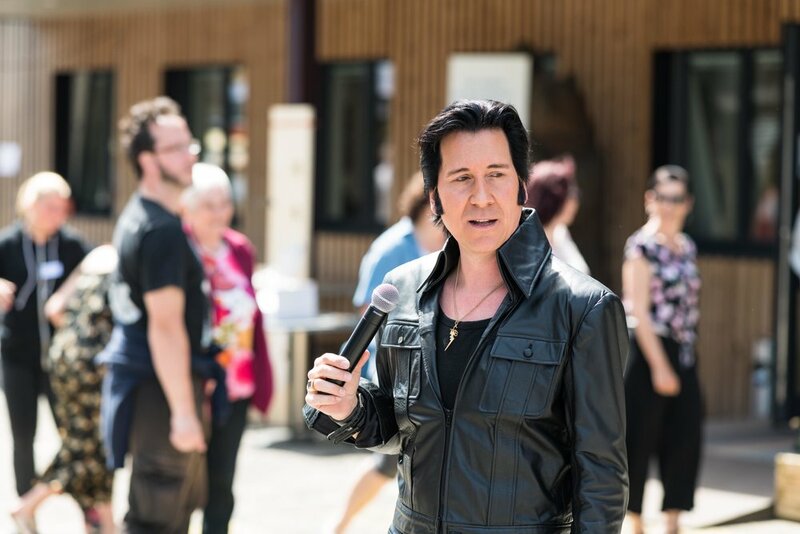 Tommy King not only interprets Elvis Presley, he also brings him life on stage and privately. He is really proud to interpret our King of Rock and Roll, Elvis Presley. With his Elvis shows, he lets the audience forget for a moment that Elvis Presley is no longer with us!But ELVIS PRESLEY lives on, in our hearts and in his music! The first two videos are in English, but I included the third one, which is in German, because of the excellent visual content.